"Augmented," defined by Merriam-Webster as "made greater," is catching on as the new "A" word in AI—which typically stands for artificial intelligence—since the technology is being touted for "augmenting the capabilities of human beings," explains Matthew Michela, president and CEO of lifeIMAGE. It also could be used to describe the outcomes being realized by enterprise imaging companies and AI businesses as they team up to apply AI to radiology; the strength of each type of company augments the other. The prevalence of unions between AI businesses and companies that market products for radiologists, including radiology reporting systems, clinical workflow solutions, and image management and sharing networks, was evident on the exhibit hall floor at RSNA 2017. For example, Change Healthcare, which provides imaging solutions, has partnered with Google Cloud and Zebra Medical Vision. "By working closely with AI companies, Change Healthcare will solve challenges that are unique to medical imaging and will make AI/ML [machine learning] accessible and practical," says Tomer Levy, vice president of the strategic portfolio for Change Healthcare. In bringing AI to their customers, companies forming these "you-scratch-my-back-I'll-scratch-yours" unions are working to overcome the shifting challenges of AI. According to Levy, the initial set of AI challenges associated with ML relate to creating algorithms, computing power, and access to labeled data. "With the recent emergence of democratization of AI and cloud computing, the first two are becoming less of a challenge and the entry barriers are lowering," Levy says. "Transfer learning in ML enables us to achieve impressive results with relatively small data sets, so one could argue that even the challenge of accessing cured data is diminishing." Levy says two challenges are often overlooked. The first is "seamlessly integrating AI/ML algorithms to the clinical workflow, ie, 'How do we make sure the new algorithms don't force the clinician to take extra steps, making the workflow fragmented and cumbersome?'" The second challenge concerns "the ability to separate the average from the great, ie, 'Which algorithms can truly outperform humans, either by speed or accuracy?'" Change Healthcare expects to overcome such challenges by working with Google Cloud and Zebra Medical Vision. Zebra Medical Vision has algorithms that are ready and approved for use, Levy says. Change Healthcare will help to "seamlessly integrate" those algorithms into the clinical workflow. "By working together, it will be easier for health care providers to procure, implement, and benefit from the algorithms Zebra developed," Levy notes. One pillar of Change Healthcare's partnership with Google will be building solutions, Levy says. "Google has ML tools and professional services that Change Healthcare will leverage to build intelligence into its [clinical workflow] solutions. Change Healthcare will use Google Cloud Platform to deliver more reliable and secured solutions that can outperform even traditional on-premises solutions," Levy says. "Together, the companies will uncover actionable insights for health care providers." Another pillar is improving care coordination, he notes. "By embedding Google Cloud's collaboration tools into imaging solutions, we will allow caregivers to communicate freely, securely, and in the context of the case in hand." Describing what Google Cloud has to offer its Google Cloud technology partners, including Change Healthcare, Greg Moore, MD, vice president of health care for Google Cloud, says, "Google Cloud provides a robust infrastructure built for the enterprise, which translates to powerful benefits for the health care industry and field of radiology. In addition to world-class data analytics and ML capabilities, Google Cloud offers essential security and privacy frameworks that allow customers to build applications and leverage infrastructure built by Google. "We actively support cloud-based imaging use cases," he adds. "For example, our cloud storage backend is DICOM aware, which can reduce the burden of IT management, in particular PACS migrations. We are also working closely with our research teams on how to bring machine intelligence into imaging archives." Levy says Change Healthcare will continue to work with other companies to make advances in AI. "Change Healthcare will develop its own algorithms and will organically deliver ML in medical imaging. At the same time, we realize we can't cover all the opportunities that AI/ML can offer in medical imaging. We will partner with platform providers, such as Google, and with our customers to build intelligent solutions," he says. "The imaging network that we'll develop will be simple to use and interact with, derive meaningful insight from data, and reduce the cost burden on health care providers. To achieve this, we will gradually transition our solutions to the cloud. This will allow us to offer superior solutions that are cost-effective." lifeIMAGE will leverage Google Cloud Platform across various solutions, such as its patient engagement tool, Mammosphere, and will use it as an extension of its network hosting strategy, Michela explains. In line with the challenges mentioned by Levy, Michela says that there is somewhat of a disconnect between creating AI and making it particularly useful in the existing workflow for radiologists. "Google has a really intensive library, a very sophisticated AI already developed and being curated, but no way to make it available to a radiologist. lifeIMAGE moves information around, inside and outside the institution, and can move algorithms inside the workflow. So, we kind of fit in the middle, between creating all these complicated—sometimes customized or standard-based—connections into all of these complicated hospital and radiology departments and the ability to open them up to participate in the universe of companies that have really innovative computational solutions in the form of AI." lifeIMAGE also will utilize Google's strengths to advance Mammosphere, introduced in 2007, which provides a means for women to collect and store their own clinical information and manage the access of that material to third parties. "There's a whole suite of other kinds of health care capabilities and services for consumers that we are working with Google to build into that platform," Michela adds. "Google's sophistication and power can help us drive the value faster than we can independently." At HIMSS 2018, lifeIMAGE showcased software created in conjunction with Google. "The software utilizes a specific type of AI that enables a radiologist to comprehensively see patients and compare them to others that are clinically relevant," Michela explains. Ambra Health, the maker of a cloud-based medical image management suite, is another Google Cloud technology partner. "Cloud-based repositories make imaging data accessible, allowing large-scale data analysis and analytics that can enable innovation and AI," notes Andrew Duckworth, vice president of business development at Ambra Health. Yet, he explains, data have to be obtainable in order for such rewards to be reaped. Google and Ambra Health's collaboration helps open the pathway to trapped data. 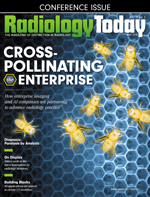 "AI is making huge leaps in the field of radiology, allowing prior patient imaging to be more easily matched, mining large data sets for key insights, and offering radiologists a second opinion in hard-to-diagnosis scenarios. However, AI companies need access to the imaging first—which is often locked in physical hardware and CDs. Imaging cloud software combined with AI allows the initial access to these images," Duckworth says. "That is why we offer Ambra for Developers and partner with several AI companies—to work more effectively together to spur innovation." Ambra for Developers, released last year, is the first cloud development platform for medical imaging, Duckworth says. "Partners are already leveraging this cloud development platform to facilitate solutions around deep learning, diagnostic decision support, teleradiology, specialized image analysis, and second opinion portals," he says. "Ambra customers benefit from the speed, reliability, and security of Google Cloud while having Ambra's best-in-class image change platform." "The collaboration," according to a company release, "gives health care providers further opportunities to gain insights from broad sets of health data, such as medical imaging, as well as enhanced opportunities for ML and AI to streamline time-consuming and expensive image management processes, and opportunities for hybrid storage models." Duckworth sees many potential use cases for AI workflow improvements in radiology, such as the use of algorithms to automatically align current and prior exams for an instant comparison of multiple studies. "AI could prove highly beneficial for radiologists by cutting down on read times and improving accuracy, and it will be a strong resource for mining large data sets for both individual patient care and global insights," he says. "Today, we provide patient matching algorithms in which we speed the delivery of inbound imaging, rapidly matching the outside study to the correct patients. This type of workflow advance improves care and efficiency across the provider network." A partnership between Nuance Healthcare and NVIDIA may prove to be beneficial for radiologists and AI companies that develop algorithms. Seventy percent of all radiologists in the United States use Nuance's PowerScribe radiology reporting and PowerShare image exchange network, the company reports. These users will now have access to algorithms and AI tools through a marketplace platform created by Nuance, the AI Marketplace for Diagnostic Imaging, which uses NVIDIA's deep learning graphics processing unit (GPU) training system. For AI companies developing algorithms, the AI Marketplace provides the channels they need to meld their algorithms into clinical workflows, according to Woojin Kim, MD, a musculoskeletal radiologist who serves as Nuance Healthcare's chief medical information officer. "This is the best way for AI developers to get their application into the hands of radiologists, because radiologists cannot go around and talk to every AI developer to buy individual algorithms; that is just not practical." "More than 20,000 radiologists use our reporting solutions," says Karen Holzberger, Nuance's vice president and general manager of diagnostic solutions. "That is very enticing to a developer or an AI startup who is trying to start delivering their algorithms and provide value. The developers publish [the algorithm] to us, we share it, and then the radiologists have access to it and can use it. "PowerShare is the cloud infrastructure that really powers the AI Marketplace," Holzberger continues. "It is our cloud-based solution that does a lot of different applications, from medical image sharing to teleradiology to the distribution of clinical guidance or decision support tools for the radiologist, and now it is fronting the AI Marketplace." NVIDIA brings its deep learning platform to the partnership, which can be used to rapidly train deep neural networks. "NVIDIA's deep learning platform will power the training and publishing of applications to the Nuance AI Marketplace, as well as the deployment in the medical imaging workflow. NVIDIA's DIGITS developer tool has a new feature to directly publish to the AI Marketplace, while NVIDIA's TensorRT will provide low-latency, high throughput inference for medical imaging," according to a release on the partnership. "DIGITS allows developers to create AI models that they can design, train, and visualize right there within its digital environment," Kim says. "This partnership is really exciting not only because NVIDIA is a leading company that provides this advanced technology from a hardware [ie, GPU] perspective, but it also provides a nice development environment. This relationship will really accelerate the development, deployment, and widespread access and use of AI technology within radiology." Nuance demonstrated applications for two algorithms at RSNA, showing how each would fit into a radiologist's daily practice. "One application would help radiologists with worklist prioritization," Holzberger says. "The algorithms assisted the radiologists and reordered the list of what they should read next." The second algorithm provides a means to determine whether a child has developmental delays, utilizing data from X-rays. "The algorithm was used to preanalyze the images," Holzberger says. "It would say, 'I believe that even though the child is chronologically 7, by the interpretation, that child is 6, based on the image X-ray.'" According to Levy, the industry, at present, is focused on applying AI/ML to analyze images. "But there are low-hanging fruits that can improve clinical workflow at much less investment," he says. He believes AI/ML will also be good for case prioritization, triage, or selecting cases for peer review. "All these are relatively easy to achieve and can have a significant impact on clinical workflows today," he says. Regarding the hurdles that have been jumped when it comes to applying AI to radiology, Levy adds, "It's no surprise that we are seeing new algorithms released every week and startups flourishing in the domain of AI/ML health care."